Most of my daily life involves cycling through busy streets with healthy helpings of trash, construction debris, traffic jams, homeless & noise to get to my office in DTLA. It sounds worse than it is. I love my daily commute. Yet as an advocate of open space, natural beauty and quiet (of which are often elusive here in Los Angeles) I must often tip the scale back towards more natural and wild surroundings . . . to, you know, keep from going absolutely insane. So I head "Into the Great Wide Open" as Tom Petty once said. Into the quiet. The hillside chaparral. The mostly unspoiled & untouched. Where exactly? What are the options? 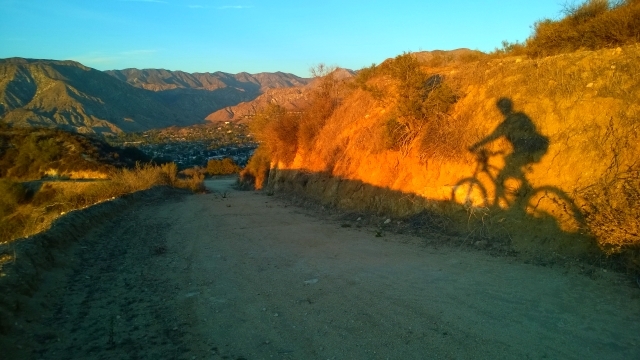 Here in the LA foothills, there are certainly places you can immerse in nature and wilderness. Santa Monica mountains 31 miles west of my front door. San Gabriel range too, including 5000 ft Mt. Lukens (just a few miles across town) and 6000 ft Mt. Wilson if you want to go big. But nothing beats the option for a quicker get-away. No drive time required. Less prep time. Grab a water bottle, maybe the bike and go. Sometimes you don't need an epic outing to get your mojo work'n. For years, I have taken to a special place, away from most things "city" for a more immediate mental adjustment. The special place? A lonely dirt road just a 10 minute walk from our driveway. It's a true blessing to have this nearby. At anytime you could get lucky with a wildcat sighting or coyote yipping. Maybe check out that neat crows nest that's been built up by a crow family, for what, like 12 years? To think things through. Or not think. Or cool off and get over some stress. Get sweaty. Get the blood flowing, the mind kick-started. Just go. Then let go. Isn't such a place sure to be discovered by hoards of others seeking the same? Well, yes. It certainly isn't a big secret and occasionally is far from lonely. But often enough the road remains quiet. You find yourself alone. Around some prominent corners and high spots, the natural beauty and calm often loft your mind to transcend above it, into the zen while sorting out the day's complications. For these things, I am most grateful. More blessings to count. If you have such a place near you, I hope you are making it a routine in your life. If not, I dare say your life isn't as rich as it could be. Any time spent at such a place is time well spent. The open space that flanks the road is slated for development including absurd amounts of housing and paved neighborhood streets. I try not think about that. But when I do, I am yet more thankful. Those forces haven't yet organized in any real fashion - although sadly - they will eventually. But for now, the road remains as is. Unadvertised, unassuming and sort of hidden. Just one neighborhood from our house. What a blessing indeed. What secret spot do you return to for inspiration or perspiration? Wait. If you don't want to spoil your secret, then never mind . Above: A sliver of December sun on my lonely dirt road. Best wishes to you, be well!! I too have many special sanctuaries that I regularly visit for a respite from the noisy and harried existence of Los Angeles. I find that I need to make those excursions daily to stay balanced and optimistic. This is my addiction, besides I need somewhere to scream "I can't take it any more" and then calm down. Hey Lyz, glad you have some special "go to" places to balance out the city.